← What is Mortgage Insurance…and do I need it?! Smoke Alarms = Rebates & Discounts!! 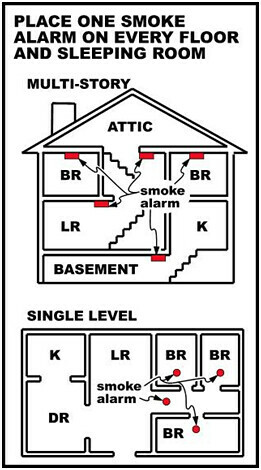 In summary, installing dual-sensor smoke alarms and carbon monoxide detectors, as well as taking some common-sense precautions and performing regular household maintenance, will help keep your family safe from the destructive and potentially lethal effects of a house fire. Schedule an inspection with your Comprehensive Building Consultants inspector to see where you can fortify your home against this threat. Posted on October 16, 2012, in Inspections and tagged Carbon Monoxide Detector, Comprehensive Building Consultants, Discounts, Dual-Sensor, Fort Myers, Inspections, Inspector Gadget, Ionization Alarms, Kiddie, Photoelectric Alarms, Property Guiding, Rebates, Russ Hensel, Smoke Alarm, SWFL Real Estate, U.S. Consumer Product Safety Commission, USFA. Bookmark the permalink. 5 Comments. I just wanted to make any visitors to your website from the UK aware that Northern Ireland has announced this week that they will be the first UK region to make carbon monoxide alarms a legal requirement in all new homes. Although a step in the right direction this does still not go far enough and we need the UK government to make the installation of CO units compulsory in all households in all regions as it seems that we are still not fully aware of the facts and real dangers of deadly carbon monoxide as here in the UK we have on average 30 deaths a year which could be avoided. We should all be lobbying David Cameron (UK Prime Minister) to make them compulsory! I am on the board of a homeowners association in Boca Raton, and Premier fire did the fire alarm maintenance and inspection on our buildings. They are committed to working along with you no matter how big or small the job is. They are the best at what they do. Check out their website http://www.premierfirefl.com or call (954) 797-7692. I would recommend them to anyone. Thanks for the referral & for reading, Greg!